In 'Tell Me Everything' Christine Hyung-Oak Lee Finds Her 'New Self' After A Stroke : Shots - Health News The stroke left Christine Hyung-Oak Lee unable remember things for more than 15 minutes. As she slowly got better, she was surprised to find that grief and recovery were inextricably linked. Christine Hyung-Oak Lee's short fiction and essays have appeared in Guernica, The Rumpus, The New York Times and BuzzFeed. On New Year's Eve, 2006, Christine Hyung-Oak Lee developed a splitting headache. She was 33, and her world turned upside down — as in, she literally saw the world upside down. Suddenly, she could hold things in her mind for only 15 minutes at a time. She was a writer who now couldn't recall words or craft sentences. She remembers looking at the phone and thinking to herself: What is the phone number for 911? Days later, she learned she'd had a stroke. "I had a 15-minute short-term memory, like Dory the fish in Finding Nemo," Lee wrote in a Buzzfeed essay chronicling her experience. "My doctors instructed me to log happenings with timestamps in my Moleskine journal. That, they said, would be my working short-term memory. My memento to my mori." 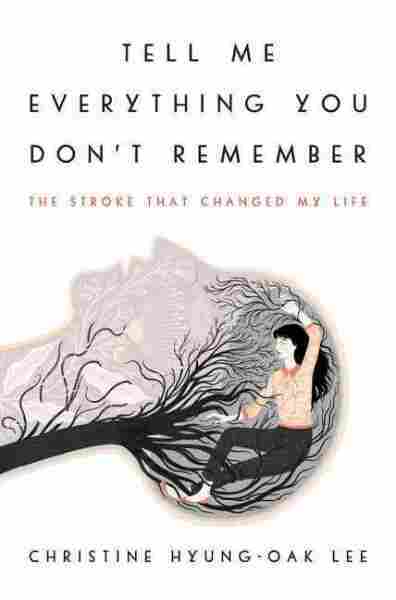 Lee used those journals to reconstruct her experience in a new memoir called Tell Me Everything You Don't Remember. She talks with NPR's Scott Simon about the silver linings of memory loss and the unexpected grief that came with her recovery. You don't even fathom the magnitude of your loss — or at least I didn't. I couldn't plan for the future. I couldn't think of the past. I had no regrets. So it's literally living in the moment. I was experiencing something that people go to yoga and Zen retreats to achieve. So it was quite pleasant. It was not pleasant for the people around me. But in that period of my recovery, where I couldn't remember everything, I think I was incredibly at peace and happy. It was frustrating. On the one hand, you want people to know: Hey, slow down for me. Hey, I'm going through a crisis. On the other hand, I was also privileged to be disabled in a way that wasn't visible. So people also didn't treat me any differently. So it was very isolating. ... When I told people that I was sick and I needed them to slow down, along with that came this need to explain my position and I ... felt a lot of resentment for having to do with that. When I was in the hospital recovering I got literature that said that depression is a part of recovery from stroke ... and I remember thinking: What? No. I'm going to be so happy when my brain is better. When people get sick there's a lot of grieving involved. Even when we have the flu we get bummed out about things we're missing out on — the fact that we can't get up out of bed, and our lost capabilities at that time. But when people get really sick, nobody really counts the fact that there's an immense amount of grieving in recovery. That's a part of almost every recovery from illness or setback, and yet I was still blindsided by it. I was still completely sad that I knew that I wouldn't be the same person again. On her "old self" and her "new self"
I really wanted to be back to my old self, but to this day I'm not that old self. I'm a new self. So that lesson has really helped me with other life setbacks. After I had my child and had postpartum depression and was gathering my life back up again, the stroke helped me figure out where I was again. It helped me understand that I wouldn't ever be the old Christine, before motherhood — that I would be the new self, the new me. I'm still sad about that. I'm still sad that there are these huge casualties of having been sick. That's separate [from] the fact that I'm still grateful to him for having been there and for being a person who knows the old me. Because that helps, you know, that that old me still does exist in his mind. I remembered things that did not happen. ... That was part of the reason I so diligently kept up a journal because I was so afraid that I would remember things wrong. So I wrote everything down. Even if it was nonsense — so that even my nonsense would be documented. I took a great number of pictures and photographs throughout my recovery as well because I knew that my memory was no longer reliable. There were parts of my journal that surprised me. I thought that I'd waited days to call my parents about my stroke. But in my journal I read that I'd called them the same day. ... I was writing the memoir right after my postpartum depression and after my marriage fell apart. ... I think at any other time reading that journal would have had an incredible emotional wallop, to have to be reliving it in that way, and it would have felt more immediate. But at that time, it was a way to figure out additional lessons from that experience to get me through both [writing] the memoir and [getting through] my life at that time. It was very gratifying, and it was as if my old me was speaking to the new me and telling me that things would be OK.